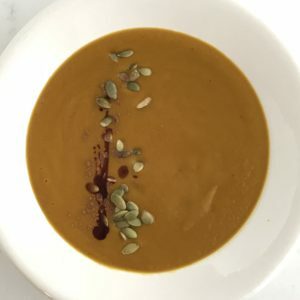 Get well soon carrot soup from Eat Like a Yogi heals you from the inside out. I heard you don’t feel so good. Come in. Sit down. Let carrot soup take care of you. I am so pretty to look at, don’t you agree? I’m bright and pretty and the color of sunshine. Already you are feeling better, yes? Did you know I’m also chock full of get well ingredients? Like ginger, which the Internets say helps kill viruses and heal sore throats, plus is warming and good for your tummy. Also, turmeric! Turmeric is all the rage for good reason—it’s anti-inflammatory and helps detoxify your body and reduce stress. WOW! My black pepper is good for digestion, and did I tell you about my garlic? It kills bad germs and helps earaches! That’s not all. I haven’t told you yet about my cayenne—good for circulation—and cinnamon—do you have any idea how good cinnamon is for you? It does so many things, including fighting germs, balancing blood sugar, and calming inflammation. WOW again! Carrot soup is so warm and nourishing. Carrot soup has got it going on! Plus I’m easy to make, even when you don’t feel good. Pretty much the only thing I can’t do for you is massage your feet. P.S. It’s probably not good for your cold, but this coconut rice pudding is almost as cozy as me! In a large soup pot, melt the coconut oil over medium heat. Add the onions and sauté five minutes. Add the carrots and all of the seasonings—turmeric, ginger, garlic, cinnamon, cayenne, salt, and pepper. Stir well to combine and cook another five minutes, covered. Add the broth and water. Cover and bring to a simmer for 20 minutes. Test to make sure the carrots are soft. Blend the soup—in batches if necessary—until all of the ingredients are well incorporated and soup is very smooth. For a nice garnish try pumpkin seeds, a drizzle of olive oil, cashew sour cream, or fruit compote.